Obesity is on the rise, but you would never know it looking at the fashion pages. As a full-figured gal, I’m always amazed that more advertising is not directed toward women like me. I’ve been curvy for the better part of my life, and my fashion sense was stunted at an early age thanks to my parochial school uniforms. Needless to say, I’m a dedicated follower of plus-size fashion bloggers. These bloggers are dedicated to showing fashion from the fuller figured perspective, opening themselves to ridicule from some for daring to show that women of all sizes are gorgeous and worth celebrating. Jay Miranda is a fashion blogger and also shares her life as the mom of a toddler. She also writes about the beauty she finds in life and love. I find her writing lyrical and her photos romantic. From Falling in Love All Over Again, which is about falling in love with her husband every day, to sponsored posts like Off to a Smooth Start, which does not read like a sponsored post, every article sounds like a story between friends. Jay’s motto is, “I believe plus-size women are beautiful and I believe style has no size.” This gives me hope that I can overcome my fear that gorgeous clothes are for the size zero girls. Determined to break away from the “stereotypes dictated by mainstream media” Grown and Curvy Woman shows that plus-size women do have style – no matter your age. Buying from non-plus size stores can be a challenge, but Grown and Curvy offers great tips on buying clothes from plus-friendly stores. I hate my arms and am always a little jealous of the women, of any size, who look good wearing sleeveless anything. Her style choice in the Right to Bare Arms or Not is very lovely, but also a great example of how to take something sleeveless and make it work to cover a problem area. Mandy Fierens is the Curvy Blogger as well as a full-time wedding and portrait photographer and model. Her blog is strictly a fashion blog — gorgeous photos of her and her flawless style, but she also offers advice on how to be a plus-size model. What I like best about Mandy’s look is that it’s easy to replicate on any budget. I highly recommend checking out the story of her wedding dress (and yes, I went to her photographer’s site to see the whole gallery of photos — stunning) and her concert outfit. Her confidence radiates off the monitor. Allison Teng is a “serial shopaholic” and the blogger behind Curvy Girl Chic. This California girl started her blog in 2009 as a way to be creative and share her love for fashion and shopping with other plus-size and curvy women. 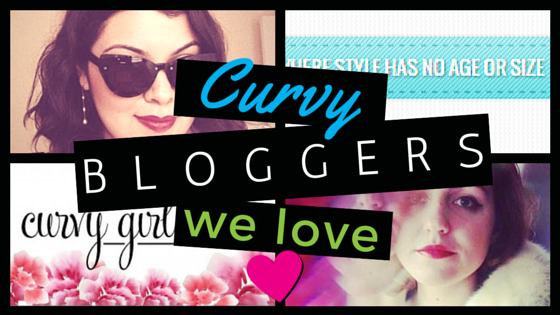 Curvy Girl covers fashion and product reviews and has been featured in Lucky Magazine, Glamour Magazine Germany, People StyleWatch, Seventeen Magazine, Marie Claire, to name a few. Allison’s style is fun, but easy going. Two of my favorite looks from her blog is the naked dress, perfect for summer, and the outfit in Faces in Places, which demonstrates the right way for a curvy girl to wear horizontal stripes. P.S. Ever wonder how we come up with ideas for our blog profiles? Our handy list of industries and subjects on PR Newswire for Journalists stays top of mind. If you’re a blogger or journalist looking for fashion news, let us know. We can customize a newsfeed for you on PR Newswire for Journalists.